Thanks God those charts belong to the past and now a days we can use more accurate tools. Hundreds of formulas and theories have been invented and put to the test, but the answer is still under debate. The ideal weight should be unique for everyone.. A tool like this would be a very innovative concept. It would provide with a more detailed and accurate explanation of what a person’s weight should be based on a number of parameters. All we need to do is just plug in some basic info into the tool, such as height, weight, gender, age, body frame, body type, etc. The results of this tool should be much more accurate than those produced by the old charts. Even though there is still no definite answer regarding the "best weight" for a person, the results obtained by most modern formulas can be considered as very good. More recent and popular tools are the ones able to calculate the BMI (Body Mass Index). BMI is a valid measurement of weight in relation to health. It is a measure of body fat based on height and weight that applies to adult men and women (Age 2-19 BMI). Due to its ease of measurement and calculation, it is the most widely used diagnostic indicator to identify a person's optimal weight depending on his height. However, due to the wide variety of body types, the distribution of muscle and bone mass, etc., it is not appropriate to use this as the only or final indication for diagnosis (NIH BMI. Furthermore, a recent study reported a misclassification of cardiometabolic health when using BMI. Millions of Americans labeled overweight or obese based on their BMI are, in fact, perfectly healthy. And the other way around, million others were labeled healthy when, in fact, they were obese or overweight. 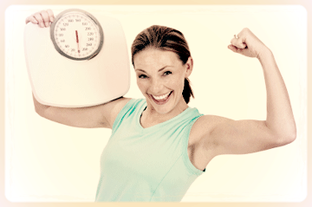 Knowing your Ideal Body Weight is the first significant step towards reaching good health. Improper weight management may lead to many lifestyle diseases. The Ideal body Weight calculation for adults should provide us with the appropriate weight for a given height. As mentioned above, even considered "state of the art", BMI measurements could lead to misclassification, and the numerical values provided by BMI are "static", non predictive. That is, it does not take into account the probability of someone being classified as healthy could, in fact, be unhealthy, or vice versa. It does not take into account either, in cases even properly classified as healthy, the probability of these cases to return or become unhealthy in a certain period of time. Could this mean the end of BMI? I do not think so. Perhaps, BMI only needs some sort of adjustment, recalculation or normalization to prevent BMI values wrongly classify individuals. To avoid such situations Virtual Personal Trainer introduces the Healthiest Area (HA) which is a sort of Normalized Ideal BMI Weight aiming to achieve the "Healthiest BMI Ideal Weight", a new measure with predictive features and ideal for long-term Weight Loss success (scientifically proven). This new measure avoids potential unhealthy situations such as overweight or underweight. Furthermore, the new measurement fixes the misclassification issue reported by using BMI values only, while still giving BMI values its significance. This new Healthiest Area measure is integrated within an automatic tool we called the "one-click-to-health" tool. With this tool people can assess their current health status by consulting their current BMI and Ideal Weight measurements, other important information, plus the novel predictive value of the Healthiest Area measurements that will inform of the probability of being over- or under-weight in the future (+ INFO). The information produced by this tool is provided for educational purposes only. This information should not be used for the diagnosis or treatment of any health issue. The side graphic shows an example of the output generated by the "one-click-to-health" tool. 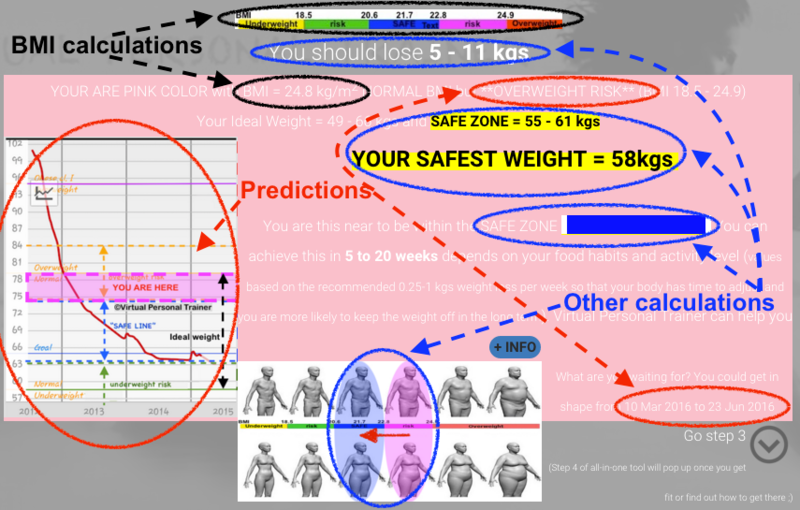 This case is interesting because in this real scenario, the individual (woman, 31 years old, height = 163 cms, weight = 66 kgs) even though her BMI is considered NORMAL value, our one-click tool produces a warn message about her "OVERWEIGHT RISK". This gives the user the opportunity to reverse that prediction by taking some sort of action. It also provides with some information and schematic of the potential dates she could achieve her Ideal Weight in case she decides to initiate some sort of diet or fitness plan. Unfortunately, it is important to note that a perfect weight calculation or prediction can be very subjective and sometimes objective. For example, if you are 8 lbs over your ideal weight, it may not necessarily mean your physical appearance is poor. Reason being, even if you are carrying extra fat tissue it may not seriously affect your physical appearance. Personal preference and opinion will weigh heavily on how you wish to approach the goals of your weight. A much better approach in the future should take into account these subjective or objective factors and make this tools even more accurate.